NOTE; the procedure has changed, please go to the Page below for updated instructions. 2. Click on Sign Up and you will be taken to a screen that looks like the one below. Click on the image below to view it better. Type in your E-mail Address, a Username of your choice, and a Password. If you want to create your own blog, then you need to type in a blog address for your Blog. WordPress will tell you if the name has already been taken. If it is, you will need to think of and type in another title that you like. Then click on Sign Up underneath Basic to start your own free Blog, AND this will also enable you to support other Bloggers. 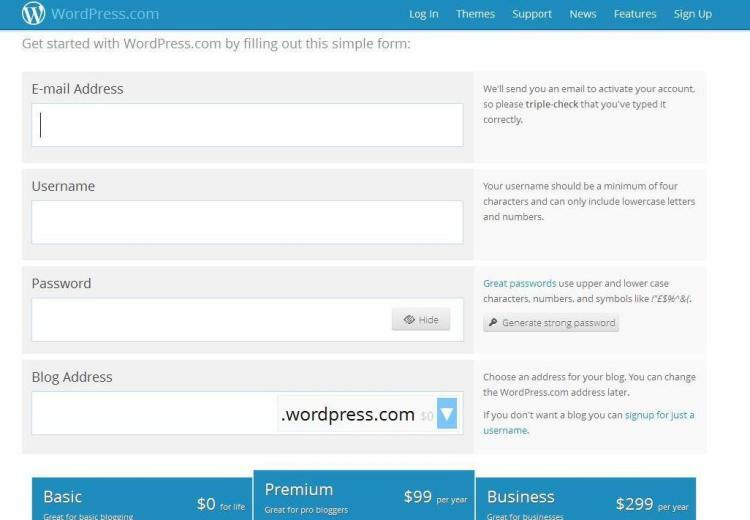 That is, you will then be able to comment upon other WordPress Blogs by signing into your WordPress Account.